The ambitious, investigation-focused L.A. Noire is now the UK's fastest selling original franchise of all time. Over the course of the week (ending May 21), Team Bondi's debut shot up the UK charts to the number one spot, according to Chart-Track. It beat out The Witcher 2, also released on May 17, and previously established contenders Lego Pirates of the Caribbean and Brink. Despite the PS3 version offering the convenience of a single disc - as opposed to three Xbox discs - and an exclusive mission ("Consul's Car Traffic Case"), more than half of the copies sold were for Xbox 360. Kind of ironic, considering the game was once a PS3 exclusive. Part of this could be attributed to the PlayStation Network being down, but, even then, Rockstar titles have a history of selling best on Xbox 360. While Australian developer Team Bondi is just getting started with the release of L.A. Noire, part of the team previously worked on the London-based The Getaway series while at Sony subsidiary Team SOHO. The two PS2 entries in the series did fairly well in the UK, despite remaining relatively obscure elsewhere. This along with the UK's history with film noir (The Third Man, for example) could be part of why the game sold so well. Until the game's release, only the few who played Rockstar's latest knew exactly what they were in for. Most of us, myself included, relied on Rockstar's slick trailers and made assumptions on the game's quality and content based on Rockstar's high pedigree. 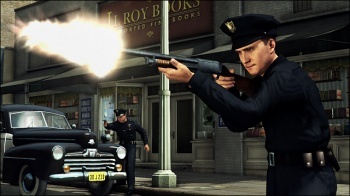 It was unclear from the trailers whether L.A. Noire would be a fast-paced, action game in-line with previous Rockstar titles or a slow burn, adventure game. As misleading as some of the advertisements and trailers for the game may have been, it seems to have paid off with record-breaking sales and positive reviews. Speaking of which, look forward to ours tomorrow.